Sometimes in life, we meet people that we instantly have a special connection with. There’s a special chemistry that results when two souls meet that share similar visions and passions in life. This past June, I met such a person at a World Refugee Day event in Phoenix, Arizona. He goes by the artist name “DJ Grin”. He performed with a collection of songs and dances with a group of African refugee youth that he mentors in Tucson, Arizona. During the social portion of the event, we had the chance to talk and share about our work in music and community building. I was instantly struck at how much enthusiasm and sincerity was beaming from his soul. 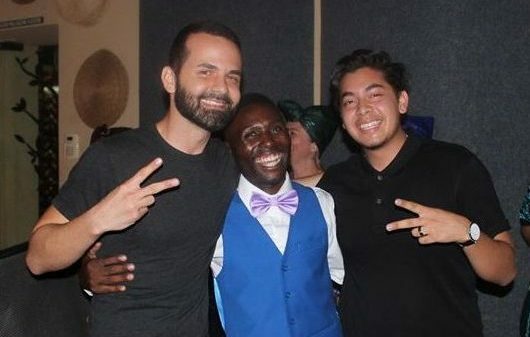 Well, fast forward a few weeks later when DJ Grin invites me and my good friend Jose Maria Fierro to come down to Tucson to perform a couple songs at his album debut and I knew I couldn’t miss it! I’m so happy and honored that I had a chance to be part of the event! The event was both an album debut, as well as a Refugee Youth Empowerment Concert, so most of the featured performers were refugee youth from various African nations that DJ Grin works with in his community. I was completely blown away by the talent and spirit that shined from all the young people. Dancers, singers, rappers, photographers, they were showcasing so many skills! And it was clear that much work has been done by DJ Grin and others in the community to provide an environment where the creativity of the youth could flourish. It inspired me to continue creating as an artist and educator, in order to help the next generation of young people find their voice and power of expression in order to uplift and inspire the world. Props to you DJ Grin! Below is a video of Jose Maria Fierro and myself performing at the Refugee Youth Empowerment Concert! The track is called “Free”, which is a new song we created for an upcoming collaborative album we are spearheading. What do you think of the new song? Do you know any other inspiring people in the community working to empower youth? Let me know by leaving a comment below! Love how the youth just get up and dance when they are moved by the music.